"Not only looks nice on the table but is also easy to clean for daily use." "Beautiful and durable, and well worth the slightly higher price tag." "Attractive, affordable and have a trendy, boho feel." "Cute and functional, and totally safe for your child." "Not only look elegant on a casual or formal table but they are also easy to clean." "Incredibly easy to cut down to size and create a custom fit for your table." "The best choice for those wanting to avoid messy spills and make cleanup easier after meals." If you are looking for a placemat that not only looks nice on the table but is also easy to clean for daily use, the Chilewich Mini Basketweave placemat is the choice for you. Available in 16 different colors ranging from a poppy guava to a more subdued parchment this placemat can work both indoors and out and just needs a quick swipe with a sponge or a quick rinse under the sink to clean. Fans of Chilewich placemats love that they can be used for casual takeout pizza to a more formal affair with friends. These placemats can be dressed up or down and will last for the long haul. Linen is a stylish choice for textiles, especially when decorating a table. These Belgian Flax Linen Placemats from West Elm are beautiful and durable, and well worth the slightly higher price tag. They are made from 100% Belgian flax linen and backed with a second, heavier layer of linen to help them stay in place. The flax linen has a washed, lived-in look, so it's not starchy or stiff, and it can easily be tossed in a washer after messes. Each placemat is 14" by 19” and comes in a set of two. You can choose between five subtle colors, such as midnight blue or light gray, depending on your decor style. If you're looking for a higher end placemat with a farmhouse-chic look, a linen placemat is a great choice. At less than $25 for two, this West Elm flax linen set is an excellent value and will look beautiful for years to come. These Threshold Silver Kitchen Textiles Placemats from Target are attractive, affordable and have a trendy, boho feel. The white, black and silver pattern nicely accents white porcelain or solid colored plates, giving your table a punch while maintaining a clean, minimalist feel. These placemats are sold separately so that you can buy as many as you need, and each one is 19” by 14”. They're made from cotton and polyester, but due to the delicate woven pattern we don't recommend putting them in the wash—spot clean them instead. These placemats are a great way to incorporate a Moroccan-style decor theme into your home. Reviewers say that the Threshold textiles placemat looks more expensive than it is, though some do note that washing them will cause them to shrink and become misshapen. There's a little bit of sparkle woven into these placemats, but reviewers note that it's subtle enough to work alongside any decor scheme. Every parent knows just how messy meal time can be with a baby or a toddler, and a placemat is a great way to eliminate those messes. We love the UpwardBaby Silicone Placemat because it's cute and functional, and totally safe for your child. This three-piece non-slip silicone placemat set is made with 100% BPA-free silicone and designed to stay in place while your baby finishes his meal. The cute cloud design is great for any child, and each set comes with a gray, a blue and a green placemat. They're also extremely lightweight and easy to roll up, so you can take them on the go the next time you head to dinner with family and friends.. Each mat measures 11" by 3" by 3”, the perfect size for babies or toddlers. Reviewers love these placemats because they're safe for children and simple to use. Many suggest utilizing them for arts and crafts as well as mealtime, stating that their versatility is one of their best features. The silicone grip helps keep them in place no matter the activity; they're a great choice if you're looking for a kid-friendly placemat set. A round placemat is a smart option for those who have a roundtable, minimal space or just like the look. These braided polypropylene placemats not only look elegant on a casual or formal table but they are also easy to clean. Choose from a grass, navy or seafoam color to transform your weeknight dinner into a transformative meal. These come in a set of four and measure 15" diameter. Reviewers remark how these add a lot to their dining area but some people with kids say big messes like yogurt can be tough to clean. 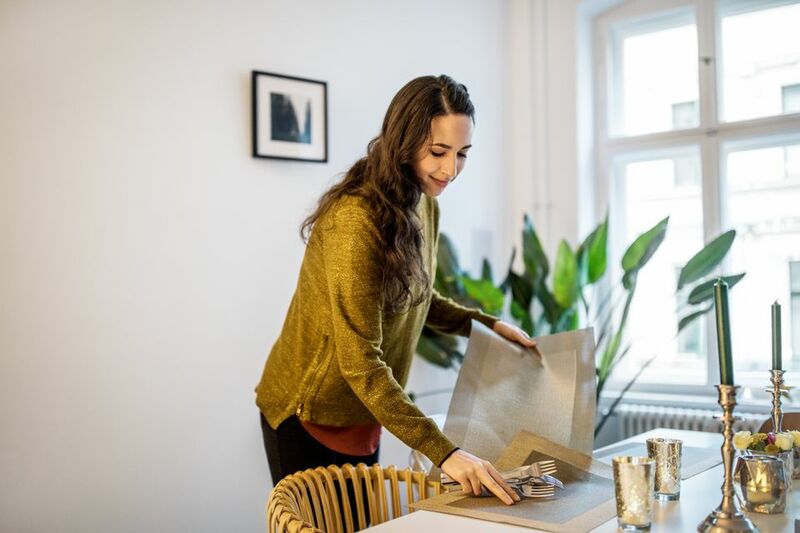 If you’ve ever set a hot plate on your expensive wood table only to find burn marks left behind, these Pauwer Insulation Placemats will be your saving grace. Though we would never recommend anyone putting a hot pan directly on a table, you can use these to protect your table from hot cups of coffee or utensil scratches. They come in a set of four, six or eight, and are made from a PVC material that's heat resistant and easy to clean. Each one is 17.7” by 11.8”, but the nature of the vinyl material means it’s incredibly easy to cut down to size and create a custom fit for your table. You can pick between 10 neutral colors and designs—and at less than $10 for the whole set, they’re a great budget option. A plastic placemat can be the best choice for those wanting to avoid messy spills and make cleanup easier after meals. The Dasco Cabo Oval Laminated Placemat is a smart choice for anyone who is hunting for a simple, attractive placemat. Made from 100% plastic vinyl, each mat measures 12.75” by 17.5”. The rectangular shape has soft edges instead of hard corners, which makes it great for rounder tables as well as square ones. The earthy beige color is subtle and works well with any place setting you already own. 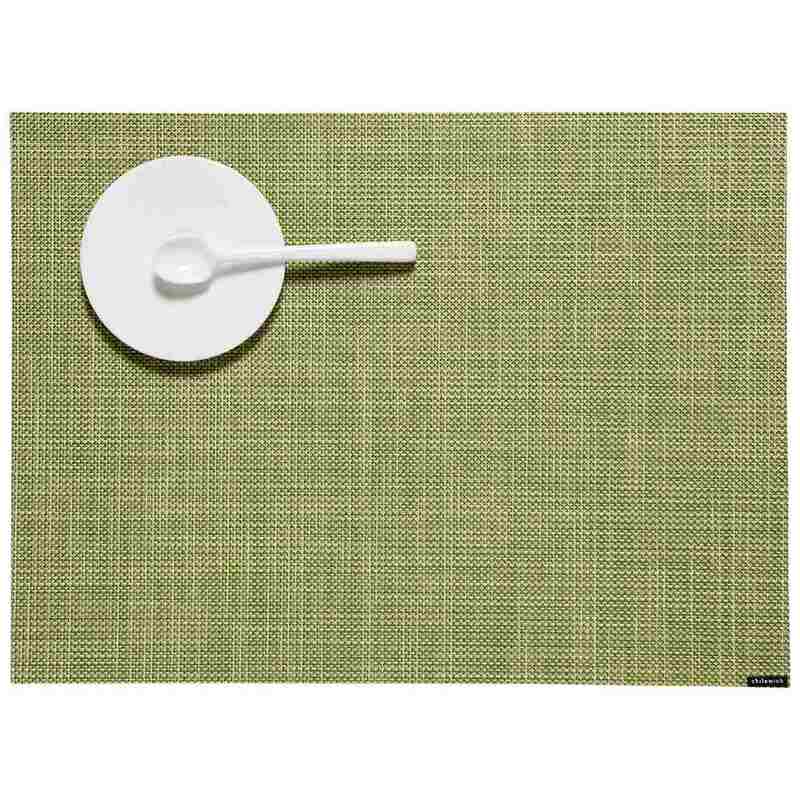 Owners like the Dasco placemat because it's durable, stylish and affordable. Many reviewers also note that the thickness of the product is great for protecting your table as well.